Programming note: Our next weekly Tidbits post will be up on Monday instead of Sunday. 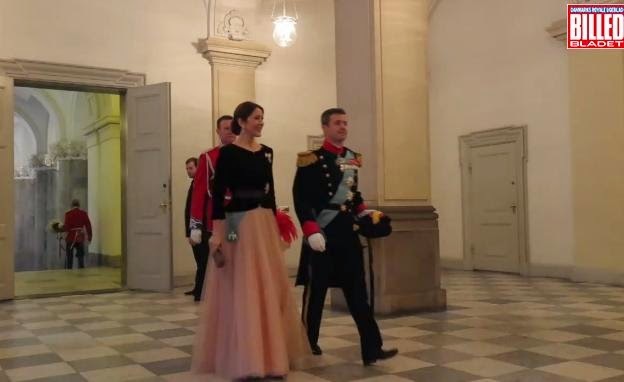 The Danish royal family held their last two days of New Year's courts earlier this week. Unlike the gala evening from last week, these are held during the day (no tiaras, it's very sad). 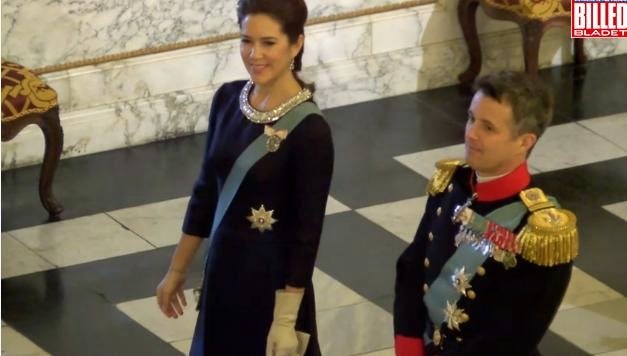 And also unlike the gala evening, the only royals participating here are the Queen and Prince Consort and the Crown Prince and Crown Princess. The first day brought another new dress for Mary, quite a treat after a run of repeats and remakes. It's a fairly plain dress, navy with a wide waistband, leaving the metallic embellished neckline to be the star of the show. At first I was a little dubious about that - why fake the look of jewelry with your clothes when you've got the real deal sitting at home, eh? - but then I saw it in action (video link below) and was predictably swayed by the sparkle. Click here for a video from Billed-Bladet and here for a gallery. The second day was a return to repeats, but oh, it was one of my favorite court outfits to repeat. All the jumpy claps for the return of this chocolate jacket and baby pink skirt, a perfect blend of colors and textures. This is the kind of over the top princess-ing I prefer on Mary. She first wore it in 2010 and repeated it in 2013, as seen below. This time she's added a belt, which I could take or leave, honestly. It's a gem of an outfit either way. As for the rest of the family members present, they're all in their respective uniforms, military for the gentlemen and a self-imposed uniform of a blue dress with fur for Queen Margrethe. She's worn the same outfit for both days for several years now. She's the Queen and she'll do as she pleases, thankyouverymuch.